The Churchill Theatre celebrated it’s 40th Birthday this week as the Footloose tour headed to Bromley. Led by pop favourite Gareth Gates and Blood Brothers actress Maureen Nolan, the production is fun and lively, although unfortunately flawed by its re-imagined concept. After his dad runs out, dance-mad teenager Ren McCormack moves to the upright American town of Bomont with his mum. Instead of finding a fresh start, Ren discovers that the tragic loss of five partying teenagers has resulted in dance (and the evils that come with it) being completely banned. He alienates himself as he attempts to fight the system, not helped by falling for the daughter of the town’s strict vicar, but he soon encourages his classmates to stand up for what is right and bring life back to the conservative community. This new touring production of Footloose takes the show in a new direction with the introduction of actor musicians. Sadly someone’s missed a trick here and having an on-stage band really dampens the effect of some scenes and distracts from the intimacy of others. When two characters are arguing and one storms towards a piano instead of storming offstage, it goes from serious to almost farcical. For a show so centred around dance and its influence, why detract in any way from the brilliant choreography? The cast are good, and obviously quadruple threats in many cases, but why have ‘good’ dancers with instruments when you can have incredible ones without? It seems a shame that maybe cost-cutting and slightly too radical artistic direction have clashed here to lose what could have been an amazing musical production. The good news is that this is not a wasted night at theatre despite noted flaws. Footloose has a truly strong 80s soundtrack that slots seamlessly into the plot and an energetic performance from Joshua Dowen as Ren is a welcome charming consistency. Gareth Gates as Willard certainly proved popular and the audience warmed to his likeable character, and probably his body too! It’s a shame that the show is hampered by the actor-muso angle, an idea that may seem revolutionary but in practice strips the production of some of its iconic qualities. Saying that, it still has heart, it still showcases talent and people still get up for a dance at the end, which is in reality all that some people want from a night out! 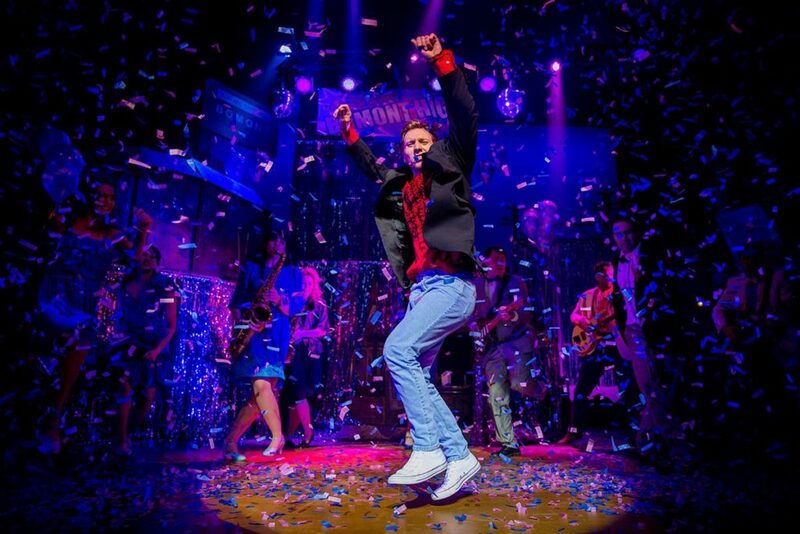 Footloose plays at the Churchill Theatre, Bromley, until Saturday 22nd July before continuing its tour of the UK. Tickets available here.